During her consultations with the couple, I recommend that they allocate 10 to 15 minutes on the wedding day for night portraiture. At this Liberty Grand wedding, I was lucky enough to convince the bride and groom to leave the reception twice. First, a few minutes before the sunset we went Next to the Renaissance Room dome and took a splendid image of the couple. The golden hour (which is a period that starts one hour before the sunset) is my favourite time to photograph bride and groom portraits. Why so? First, the soft, diffused, orange light before the sunset makes the skin look gorgeous. The angle of the sun makes the light bounce around and increase its quality. As in photography, the quality and direction of light account for about 80% of the final result, shooting during golden hour gives wedding photographer a head start. Second, after the wedding ceremony the couple enjoys a few drinks during the cocktail hour and feel more relaxed as the pressure of the wedding day subsides. When the couple is tense, it shows in the photographs and honestly, a drink or two are the best friend of a Toronto wedding photographer. In fact, I always suggest couples to pop open a bottle of champagne during their engagement or pre-wedding photo shoot as I noticed a high correlation between the moderate alcohol consumption and stunning imagery. As I mentioned above, I always ask the couples for one or two timeslots during the wedding reception where we can go around and take pictures in a relaxed environment. The way I do it is as follows: myself or my second photographer leaves the banquet hall to scout the surrounding areas for a few minutes. As a rule, we always have a photographer in the hall to capture any potential events, even when there is nothing schedule. Wedding days are unpredictable and I would hate to miss a great moment because we left on a quest for epic image. When the search is successful, both photographers discuss the scenarios and inform the couple that we are leaving to setup the lights. Once everything is set up, we asked the couple to join us and proceed to create true masterpieces. In my opinion, a professional photographer should not only wait for moments to occur but create the opportunities for great photographs. I'm of course, not saying that during the wedding ceremony the photographer should start posing the couple, even though I heard stories about that. What I am saying is that wedding photography can be taken to the next level by creating those moments we can afterwards immortalize. For example, I've been known to make funny faces in front of kids so I elicit a reciprocal reaction from them I was quick to capture. 30 years on the road the bride and groom will not even know that their nephew's funny face was actually triggered by their wedding photographer. Unfortunately, many professionals in the Greater Toronto Area consider wedding photography just a job and they never push their limits. There is a reason why their wedding albums look exactly the same regardless of the location and the couple. Even engagement photography is becoming cookie-cutter. In an effort to undercut other artists, many photographers include nowadays the engagement photo shoot in their wedding packages. That, in my opinion is a big mistake for a few reasons. First, the couple will not appreciate the value of the engagement session if it's free. Second, to keep the costs low, the photographer will offer a one hour engagement session and include 20 to 30 images. While I'm not an adept of quantity over quality, one hour is not enough even for a professional photographer to know his clients. On the other hand, I take my time and offer my couples a paid engagement photo shoot that last any time from 4 hours to two days. Because I charge for the engagement photo shoot, I can afford to give the couple more time on the wedding day so I can capture more moments, and deliver more images that reflect better the beauty of their special day. 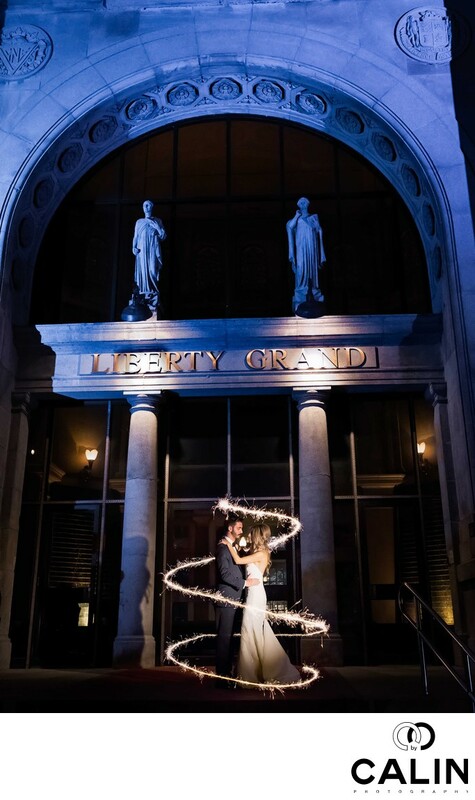 This photograph captured in front of the main entrance ofLiberty Grand is nothing short of outstanding. Firstly, despite the posed style of the image I created a sparkler spiral or on the couple, which gives the image a dynamic feel. I have to admit that I love body language and its ability to convey different moods in my pictures. Here, I asked the bride and groom to hold each other tight, which gives the shot a very romantic feel. Secondly, the combination between the blue lights illuminating the building and the tungsten light on the couple is very pleasing to the human eye. This particular colour scheme is used in design, painting, cinematography and of course photography because it is the most beautiful colour combination. During the special day I always search for such elements that help me create gorgeous images. Finally, from a composition standpoint this wedding photo is outstanding. The image achieves symmetry through balance and the couple is placed at the intersection of a few leading lines that draw the viewer's attention towards them.